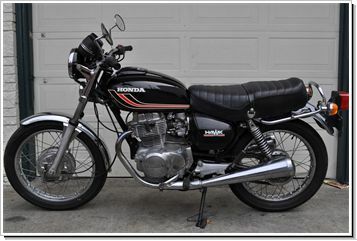 My original rational for getting a motorcycle was that with a 26 mile commute one-way to work, and with work gone insane and me working at least six days a week, I could actually save money and time on the commute, and I’d just go get a nice, reliable, conservative, Honda. Maybe a used one. 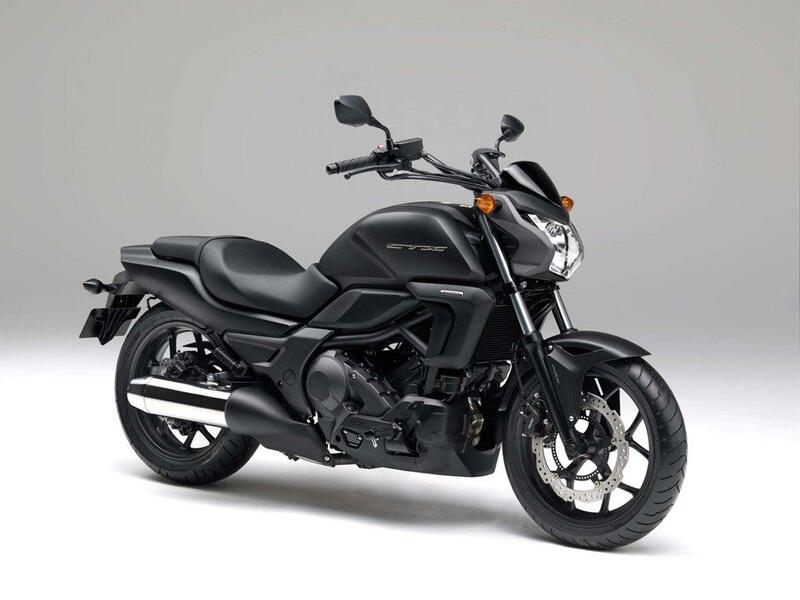 No one is every sorry for getting a Honda – they are great machines, reliable, easy to handle, and generally well-styled. I owned a Honda 400 Hawk and rode it for years back in LA. I loved that motorcycle; but one thing that really irritated me was that this model had a tendency to weep oil at the head gasket, constantly soiling my boots and pant-legs. But it was a smooth ride with plenty of low-end torque. I had a job for awhile back then delivering airline tickets. This is in the late 70s before the internet and you still got you airline tickets from a travel agent; and if you were sufficiently important, and needed those tickets right away, a motorcycle courier would be dispatched to hand carry the tickets to you. Yes, I had a job doing that for about a year in Los Angeles, and the agency was right in the center of downtown LA. This particular agency has two couriers – me and a high-spirited free soul named Australia. We were brothers in courier-ship. I was unhappily married at the time, but I did love that bike. But they are on recall for ignition switch problems. While at the dealer, I sat on a Triumph T100, fell in love, and the rest is history. 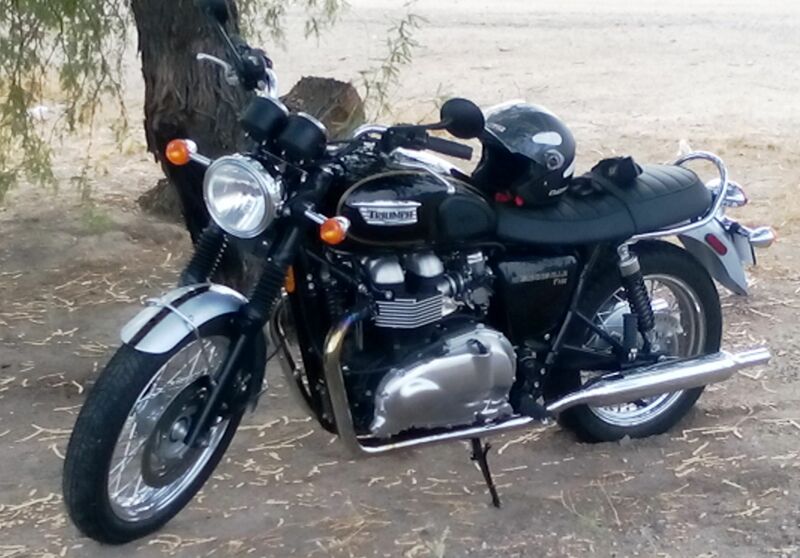 I am having a ball on that Triumph. Enough techno-talk. Let’s hit the road. The place was closed. No biggie. 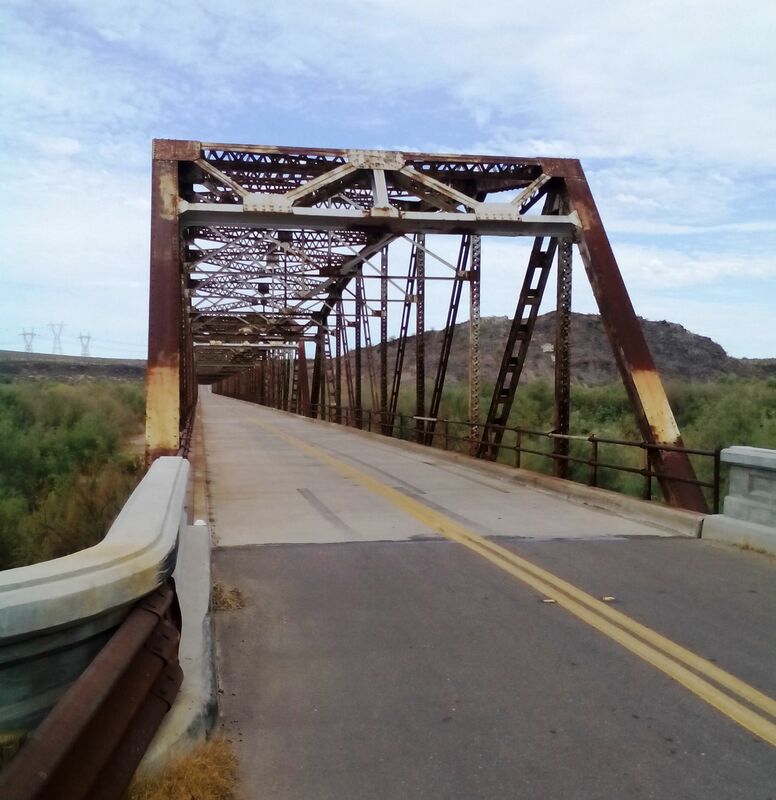 For those of you not necessarily from around here, that stretch of land between Gila Bend and South Phoenix via the back roads (old highway 80 in this case) can be, well, one might describe it as “austere”, another might describe it as, “desolate”, but to me it’s home. Lucky for me I didn’t have to stay the night. Just a day trip. You get here by taking the mighty Interstate 10 east from Tempe, but the 10 is actually running south at this point headed to Tucson. 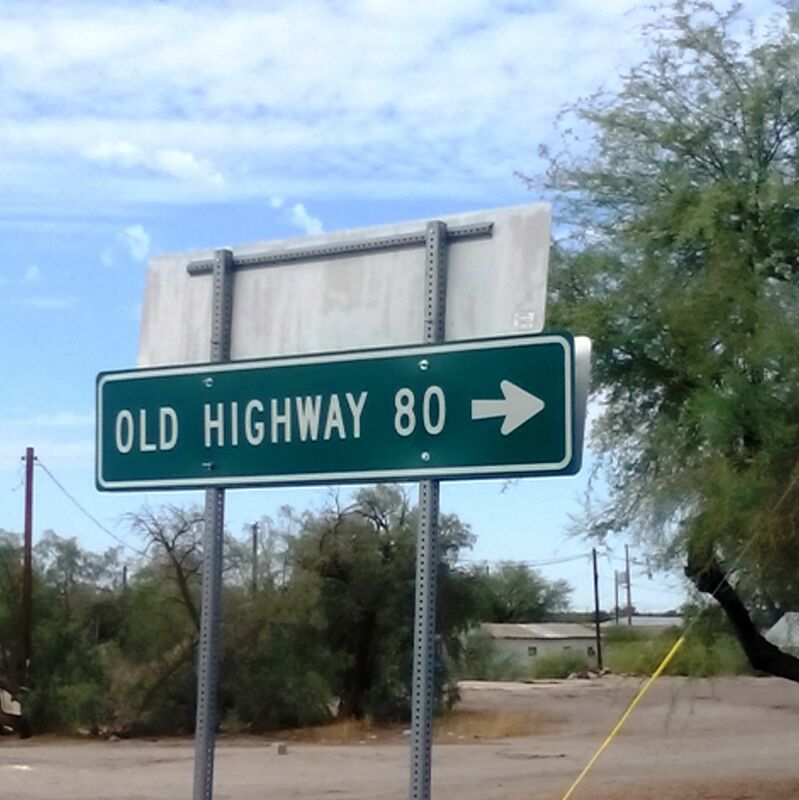 Interstate 10 runs south out of Phoenix so as to pick up Tuscon otherwise it would have become a ghost-town after the 10 was built – so it’s kind of weird; you get on Interstate 10 east, to go south to Tucson; or in my case to go south to 347 Maricopa Road, then east on 238 to Old Hwy 80 on the outskirts of Gila Bend. 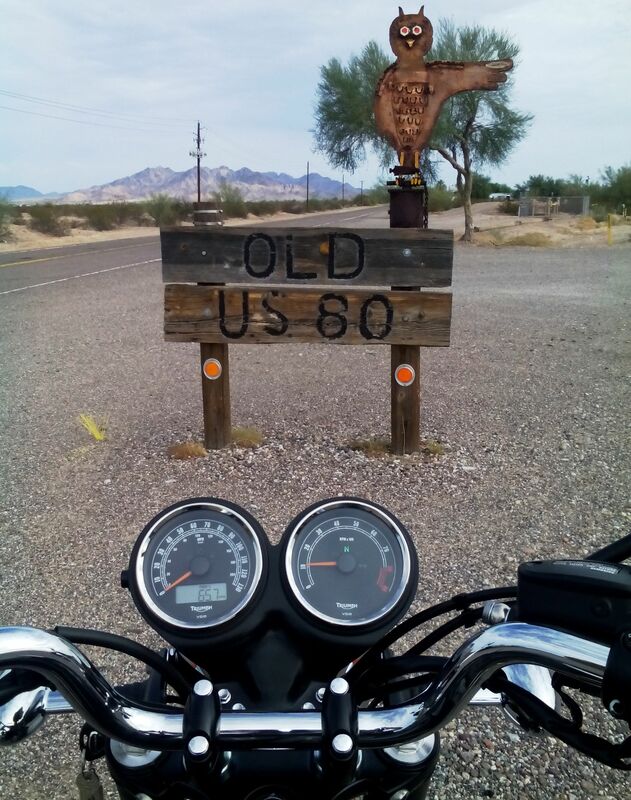 The ride north on Old Highway 80 was just ideal. The day was slightly overcast which is nice when you are out in it and it’s pushing 100 deg F. This is farmland along the Gila River. Quiet road; there’s almost no one on it typically, and today I don’t recall seeing anyone. Maybe there was someone out there, but I didn’t notice them. 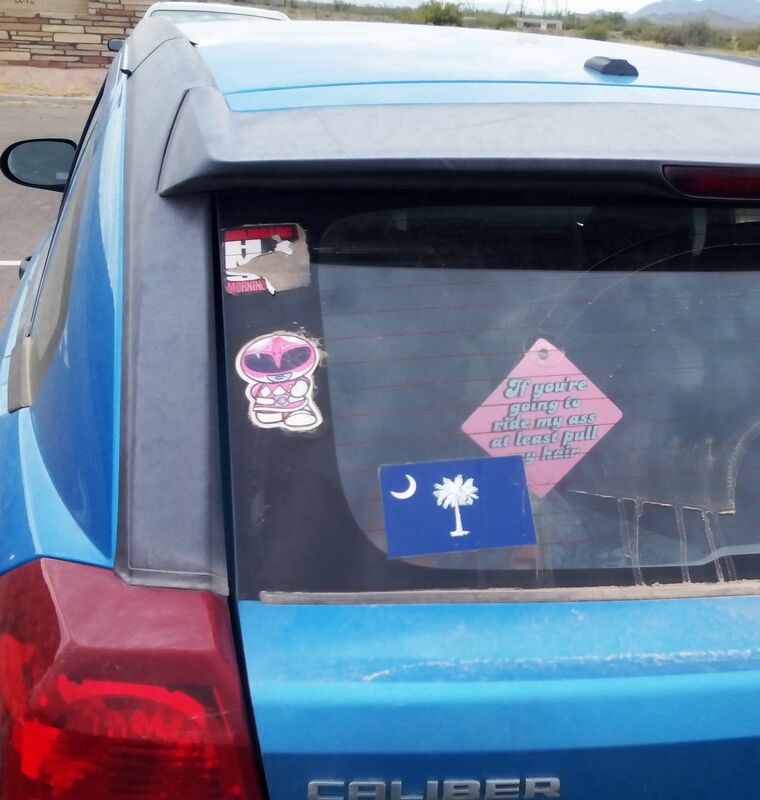 I did see this car parked at the dam though; interesting sentiment. Naturally, it was a blast roaring through that covered bridge on a Triumph! And after the bridge, there’s a long curve that drops you down into an agricultural valley, a spectacular vista. Seriously, it could have been an advertisement for a motorcycle – it was almost cliche’ – but I really liked it! Awesome fun! and just kept going staying off the 10 meandering east toward home, but veering south as need be to stay on an eastbound road without getting on the interstate. I ended up on the Estrella Parkway and eventually Estralla Park. But it was $6.00 to get a pass so I just did a U-turn out of there and back on the road. 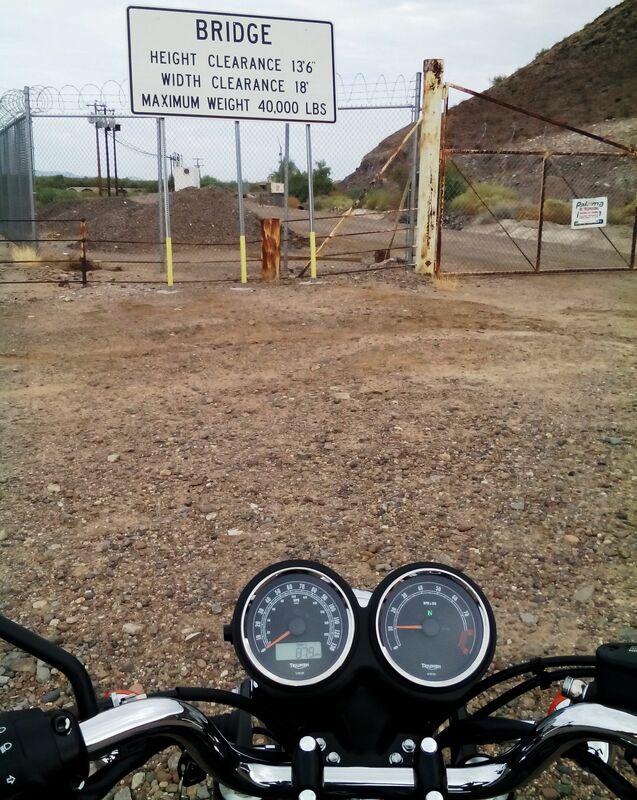 Eventually it becomes a kind of civilization out there called South Phoenix – a kind of Mad-Max Junkyard Distopia – not all bad if you’re into that kind of thing – but I’m not so I took 19th Ave north to Interstate 10 and back home. Had a ball; hoped you enjoyed hearing about it! When the weather cools down we want you to get a leather jacket. 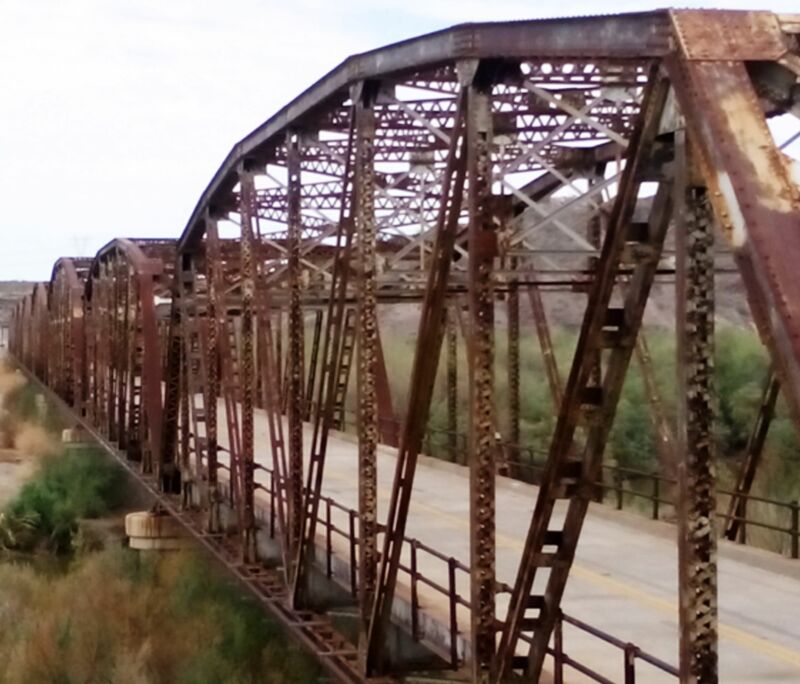 That bridge to nowhere looked awesome!! David and I hope you to get a leather jacket as soon as the weather cools down. 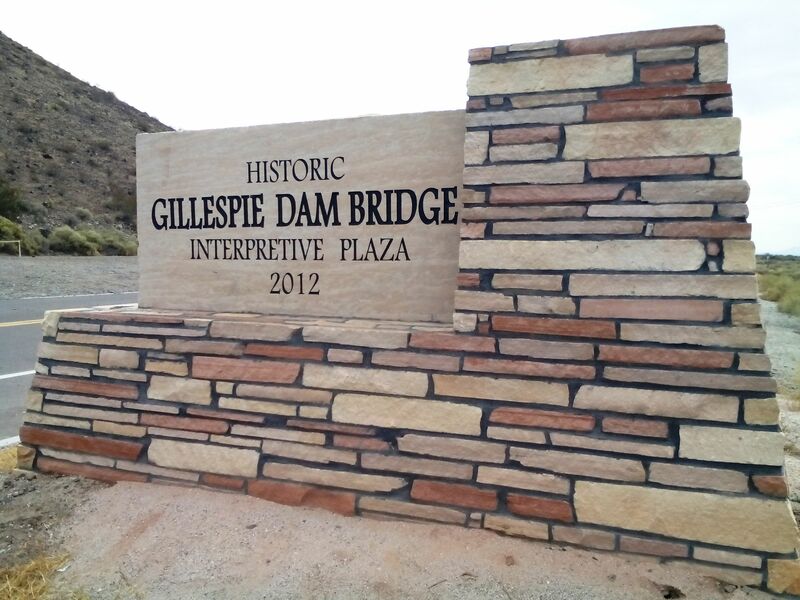 That bridge to nowhere looked like a awesome place to practice your skilz. Thanks for stopping by! Yes, I have an entire wardrobe picked out, budget permitting, and a nice riding jacket is in there.